Most forms of energy are derived from the sun. Some are locked up in the form of carbon based fuels like wood, coal, and oil and the energy is released when the fuel is burned. The sun produces energy by means of fusion. Fusion happens when two atoms are fused together to form one heaver atom. This results in releasing energy. The ability to replicate this process has not yet been accomplished by man. What has been accomplished is the discovery and use of technologies that allows us to collect energy produced by the suns fusion energy. One of these technologies is photovoltaic (PV) cells. If we were able to harness just 0.02 of the sun’s energy that strikes the earths surface, it would satisfy all of our energy needs. The ability to extract energy from sun light was first observed by Frenchman Alexandre-Edmond Becquerel in 1839. The first commercially available PV cell was licensed to Western Electric for $25.00, or $1.785.00 per watt. Today’s price for solar cell installed in a panel is less than $2.00 per watt. The price per watt was close to $4.00 just a few years ago. These lower panel prices have made PV solar development more competitive with other forms of energy production. 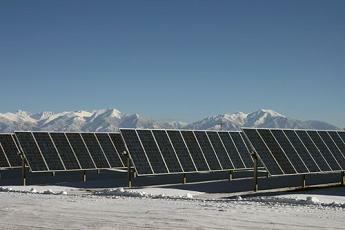 Reliability - PV technologies have a proven track record of reliability. With no moving parts, there is very little to go wrong. Costs - Lowering of PV equipment costs , and government incentives have made this technology competitive with other forms of power generation. After installation, very little maintenance is required. Very little earth work is required for site preparation, lowering construction costs. Installed components are easily assessable and require little if any heavy equipment for installation or replacement. 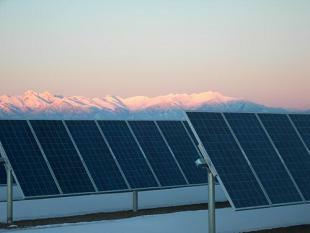 Scalability - PV power systems are easily scalable. 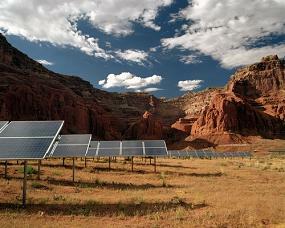 Solar arrays can be built to any size and the efficiency is the same regardless of size. This allows the technology to be installed at any site where there is goodsun light and an electric grid interconnection is available. Environmental - Solar panels are benign. There are no emissions, there are no chemicals that can leak or spill. This technology has little to no negative environmental effects. Sighting - Sites suitable for solar arrays do not have constraints common to other power generation systems. Any site that has available sun, and a grid interconnection that can handle the generation capacity can support an array.